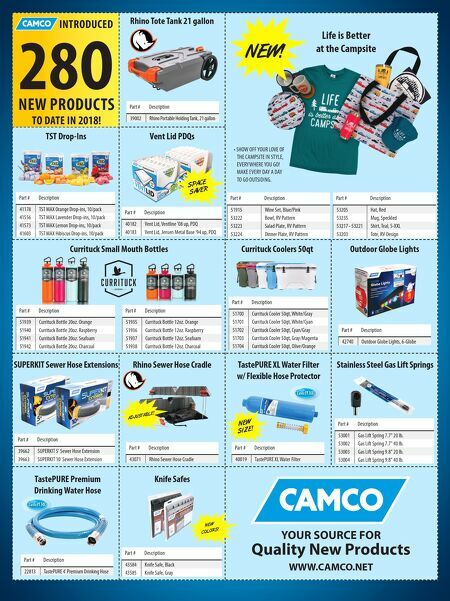 18 • RV PRO • November 2018 rv-pro.com O P E N H O U S E C O V E R A G E Lance 2465 Lance Camper officially debuted the 2465 travel trailer – its longest travel trailer to date – as a prototype at the 2017 National RV Trade Show. It didn't take company officials long to figure out they had a winner on their hands: Dealers were very receptive to the product and orders are now running 12 months out, according to National Sales Manager Gary Conley. Still, company officials determined some updates were in order after speaking with dealers at the Louisville show, which it has since incorporated into the trailer, which began pro- duction in September. Those tweaks include replacing a front rocker chair with a J lounge, widening the front Sky-View panoramic window to nearly 5-feet wide, and adjusting the floorplan dimensions to create a bit more space for the fireplace in the entertainment center. The 2465 has floor length of 24 feet, 11 inches and two good-sized slides on the driver's side, giving it a spacious feel, and yet it is an ultra-lite trailer with a dry weight of just 5,700 pounds, according to Conley. The fact that the trailer has 14 windows – including the large Sky-View portal at the front of the coach – further adds to the light and airy feel of the trailer. Lance has made good use of the extra space. In the rear bed- room, there is a king-size bed with pillowtop mattress in the rear slide, across from an optional 40-inch LED TV on an electric lift. The mid-bath coach features a residential under-mount oval bathroom sink, a porcelain marine toilet, and LED vanity lighting. The galley is equipped with a Villa residential-style sofa, a dinette with large roll-out storage underneath; Euro-style cab- inetry, a Dometic stainless-steel three-burner range with glass cover; a 6-cubic-foot, double-door refrigerator; a residential under-mount large single sink; and a stainless-steel range hood with light and fan. Another 40-inch LED TV in the galley is available as an option. Notable exterior features include U.S.-made Goodyear tires, dual-pane frameless windows, and dual air conditioners on top of the coach. A functional hitch on the rear of the trailer is rated to 130 pounds, allowing it carry bicycles or a basket with supplies or a small genset. A roof-mounted carrier for kayaks or other equipment is available as an option. The trailer maintains the quality construction values Lance is historically known for, including a one-piece PVC roof; a laminated and insulated floor and roof; block foam insulation throughout; aluminum-framed sidewalls, floor and roof; and Azdel interior panel walls. A four-seasons all-weather package is available as an option. The MSRP for the 2465 is $47,407. What impressed RV PRO: The 2465 doesn't feel like it had to give anything up in order to make it fit a certain weight class. The front living room has a nice ambiance to it, and the king-size bed is an unexpected surprise for a travel trailer. 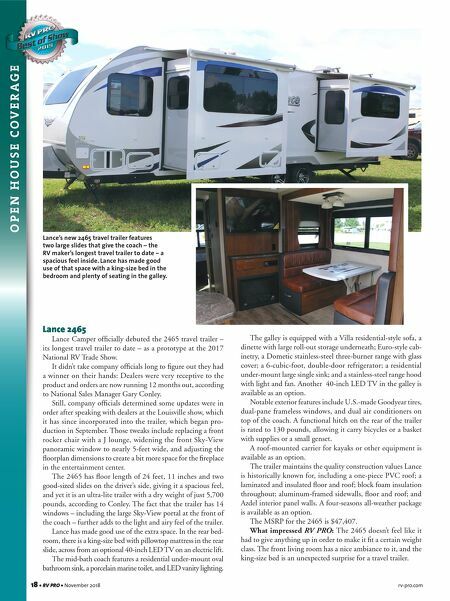 Lance's new 2465 travel trailer features two large slides that give the coach – the RV maker's longest travel trailer to date – a spacious feel inside. Lance has made good use of that space with a king-size bed in the bedroom and plenty of seating in the galley.